David Gates (of The Rural College of Art) is obsessed with things. Not so much the things themselves, as their essential thingness. These are things frequently discarded in the first instance by others, sometimes by the artist, and then subject to being re–purposed. 'Found & Forged' is Gates' second solo show in the gallery. In it he is seeking to elevate the act of repetition and appropriation, both through process and outcome, to a possible art. He begins with the set that remains of the previous exhibition: Lothar Götz's 'Pas de Trois' – which was, in part, a staging. This is no collaboration, more an invitation under strict license. 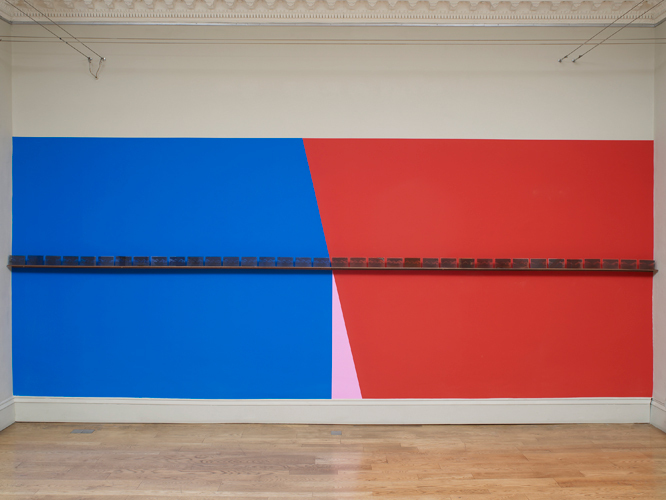 Two distinct bodies of work will be exhibited, bearing no apparent connection with each other beyond dogged persistence; each displayed on a linear shelf that runs around the perimeter of the gallery. In 'Found & Forged' (2016) Gates takes an everyday tobacco pipe and a two–to–three million year–old left–handed seashell, and casts and re–casts them again. The focus here is repetition. The 're' of repetition in which Gatesian practice is grounded, here refers to the improvised moment: again and again and again. The setting up of a system infers rules/parameters/limitations/an impasse – yet somehow it remains open to the unexpected. The pipes overlap and disrupt one another in trying to repeat themselves; each one different from the machined original; turning and twisting; slipping into a shell shape, itself reversed, fossilised, different, distant. 'Carland' (2006) is a series of one hundred and sixty three (approx.) postcard–size pinhole plates on glass, taken in the seaside town of Jaywick, where all the roads are named after makes of car. It was originally exhibited as a video animation of 03:48 minutes. Here, Gates has installed thirty–six plates in a continuous sequence, representing fifty–three seconds from the animation. This exhibition marks the tenth anniversary of 'Carland', and we are markng this with the publication 'Carland' which presents sixteen lifesize images, folded as a map, litho–printed at Calverts, London (see below). The subject in both bodies of work is the object. The glass plates reflect an intermediary position – a pathway, mechanical and produced, a process where each plate was treated the same to varying results in terms of image and surface. The pipes are also an end to a means – a support for images, fused but not fixed. "you say it best when you say nothing at all."